How do you find and select an installer for a photovoltaic system for your home? I considered installing it myself. But the state rebate program, as well as the power company (if you are going grid-tied) and my homeowner's insurance insist that the system be installed by licensed professionals. Also, when I compared the cost of doing it myself, including permits and getting engineering drawings approved by licensed engineers, with the various quotes I got from licensed installers, there wasn't much difference in price, not enough to justify all the extra work and risks on my part for installing it myself. The installers are probably getting much better discounts on the components than I could get, with the difference almost covering their labor costs. You could find an installer by doing a net search for your area, looking in the telephone book, or attending various home shows or environmental expos in your area. The problem with these methods is that anyone can present their business through these methods, including amateurs and fly-by-night outfits. It would be better to select from a list that has been at least somewhat prescreened. The ASES (American Solar Energy Society) has been offering a tour of solar installations one of the first weekends in October for the past few years (www.NationalSolarTour.org). They feature various solar installations in your area. The installers are listed for all the installations on their tour. You get a chance to see an example of these installers' work. They also often provide a list of other installers in your area. But you don't have to wait for a tour as they do have installer lists and other helpful info on their website. In Florida, the Florida Solar Energy Center (FSEC) is another good source. 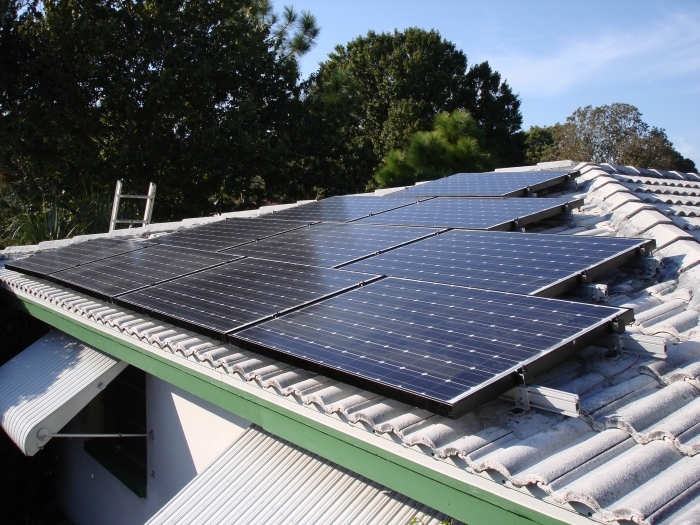 By Florida law, all solar installations must be approved by the FSEC. They have a list online of the systems they have approved and the installers (http://www.fsec.ucf.edu/en/industry/testing/PVsystems/certified_systems/index.htm). You can check out the installers on this list that are in your area. One problem with this list is that they don't appear to be updating it regularly on the website. I used the last two mentioned resources for finding installers in my area. My preferences were installers that have been in business at least 10 years, with at least 50 photovoltaic installations, and can show that they have experience installing grid tied systems that have battery back-up. As a reminder from previous my blog articles, I was looking for a system with a minimum of 2000 W of panels, grid tied, with at least 10 kW-hr of battery backup. See my previous articles for the reasons for these requirements. I contacted around a dozen companies. Some no bid because they didn't feel my system was big enough to justify the distances they would have to drive for the installation (these were mostly Orlando-area companies). Some just gave bids over the phone or Internet without even seeing my house. This didn't give me a lot of confidence as they had no idea what my shading, roof construction, attic access, etc., was like, so they were quickly rejected, especially since their quotes weren't much different than anyone else. Solar Source was by far the cheapest. They are also the largest solar installer in Pinellas County, where I live (population just under 1 million), with probably more installs in this county than all the other installers combined. I could find info indicating they have been business since the mid 1980's, so they probably wouldn't disappear next month. But a number of things bothered me about my contacts with the company. First, their salesman insisted they could only install the panels on my west facing roof section (I have a hip roof with slopes in all directions with no gables). My studies indicated that that was the most shaded section of my roof with the least average hours per day of direct sunlight. I really wanted the panels on my south facing section of my roof, which is typically best in the northern hemisphere, though my analyzes indicated that a south orientation would only get me about 8 percent more power than an east or west orientation, since I have a shallow 14 degree roof slope. This assumes no shade. But the south roof section has a lot less shade and the shade that is present I have more control over and can significantly reduce if I need to. When considering shade, my analyzes indicate that I would get between 30 to 50 % more power from panels on the south roof than on the either east or west roofs (the sun exposure on my east is not much better than on the west). My sizing study indicated that I could fit 2000 W of panels, though not much more, on my south roof. The others who saw my house and gave me quotes also felt they could fit the panels on my south roof. The only reasons I could figure out for the Solar Source representative's insistence that the panels be mounted on the west facing roof is 1) that is the second biggest continuous roof section, since the longest dimension of my house runs north-south, so it would make their installation the easiest, and 2) the front of my house faces west, so panels on the west roof would be the most visible to the general public and give them the most advertising. These seemed like very poor reasons for me to take a significant hit in the output of my solar installation. I was also having a hard time getting them to list exactly what major components (manufacturer, model numbers) they would be using for my installation. Their attitude appeared to be “We're the experts. Trust us, you'll like whatever we give you.” But this is the second biggest purchase I've ever made in my life. If I were having a room added to my house, hearing the contractor say “Trust us, it will be this many square feet, have a floor, four walls, and a roof” would not be too assuring to me that I would like the room they build. I would want to know the room's dimensions, how many and what kind of windows and doors and light fixtures and outlets and closets, etc. And a solar electric installation cost as much or more than the typical room addition. When I did finally get them to give me some specifics on the components they intended to use, I ran the panels they proposed through the inverter manufacturer's compatibility software (http://www.sma-america.com/en_US/products/software/sunny-design.html) and found out that the panels they proposed would apply too much voltage to the inverter they proposed and potentially damage the inverter. So they obviously weren't going to use these panels in this installation. I suspect the reason they were reluctant to list specifically what they were going to use for my installation was so that they could have the flexibility to choose the cheapest equivalent components at the time of my installation to maximize their profit. But that would not assure giving me the most efficient system for my location and money. The importance of all this will be more apparent in future articles on this blog. All this does not imply that Solar Source is a bad company. As I mentioned earlier, they have by far the most installations in my area, so they must be doing something right. I could find no complaints about them. The things I mentioned above are probably what allow them to bid so low and still make a profit. They were on my final selection shortlist, partly because they were the cheapest, but also because from what I learned about them I was confident that whatever they installed would work. It just would not be what I would consider optimum for my property. So, if you have a more ideal situation (big south facing roof with no shade), they are probably the way to go as you will save a lot of money with them. But with my far from ideal situation, cheapest is not necessarily the best. Harrimans Inc. was the second company on my shortlist. My research indicated that they have been in business since the early 1970's. They provided a list of about 75 references, with addresses and phone numbers, of photovoltaic installations they have done the previous two years. I saw one of their grid tied, battery backed-up installations on the solar tour. They are installing about two PV systems a week (as of winter 2009-2010), making them one of the largest installers in Florida. They were also the second most expensive of all my quotes. Harrimans was confident they could install 2000 W of panels on my south facing roof. They proposed using Sanyo HIT panels, which are the most efficient panels readily available on the market, and consequently take up the least roof area for a given power out. These Sanyo panels also tend to perform better than most panels under shady and cloudy conditions, giving even a little more power output. They are also a bit more expensive, which probably accounts for part of the higher price of Harrimans quote. Harrimans also did give me a detailed list of the major components they intended to use and listed them on the proposal/contract. They also only wanted about 25 % of the money up front with the rest due upon satisfactory completion of the job. Their salesperson also didn't try to bulls--t his way around any technical questions, like some others did. If he didn't know the answer, he immediately called whoever he felt in his company would have the answer. So, even though they were a little on the expensive side, I couldn't find anything wrong in what they proposed and felt confident the job would be done right. St. Pete Solar was the third on my shortlist. They had only been in business a couple of years and had only installed five grid tied systems as of Oct. 2009. They had never done battery backed up grid tied system. These facts don't seem to support my initial requirements for an installer. So why were they on my shortlist? One thing that has always bothered me about most solar installations is that the PV panels are mounted on the roof. Roofs eventually need to be replaced. Though I had just replaced my cement tile roof about less than seven years ago and it should be good for at least another 30 years (my first cement tile roof lasted 44 years), I still felt uncomfortable about putting the panels on my roof. St. Pete Solar was the only company that proposed putting the panels on a free-standing awning-type structure and they actually had experience with this type of installation (shown on their website). 1) Most modern solar panels are self-leaded with snap together connectors. These wires would be exposed in an awning installation. The inspectors may require these exposed wires to be in some sort of protective conduit, which would be difficult. If mounted on a roof, this is not usually an issue as few people have access to the roof and the wires are sandwiched between the roof and the panels so they aren't really exposed. I didn't really want to fight this battle. 2) Mounting on the roof does provide some shade for that roof area, which reduces air conditioning requirements a little. 3)The panels themselves are less likely to be damaged on the roof than they would be on an awning type structure that people could and would be walking under. 4) After talking with some people, I found out that removing and reinstalling the panels is much less expensive and not as big a deal as I originally thought it might be, though, with my relatively new roof, this may never be a concern in my lifetime. So having the PV panels mounted someplace other than the roof was looking less attractive. Also, the cost of going with St. Pete Solar was not much cheaper than going with Harrimans and they had never done a grid tied, battery backed up system before. If they were significantly cheaper, like $6000 or more, which would more than pay for a potentially fried inverter, these concerns could probably be lived with. But the risks and extra hassles for my particular installation weren't worth saving just one or two thousand bucks. But if I would have been going strictly grid tied with no battery backup and didn't have the zoning issue, I probably would have gone with them as they seemed quite knowledgeable and I liked a lot of the things they did with their installations and they would have been a lot cheaper than all but maybe Solar Source. So I ended up choosing Harrimans. It was worth it to me to pay a little more for a lot more power generated.